New York: Sikh activists from North America and Europe have jointly filed a complaint with the UN Human Rights Council (UNHRC) against Punjab government’s denial of permission to hold November 10, 2016 gathering at Talwandi Sabo (Bathinda) named as: “Sarbat Khalsa 2016” by the organizers and retaliatory crackdown on Sikhs in Punjab. 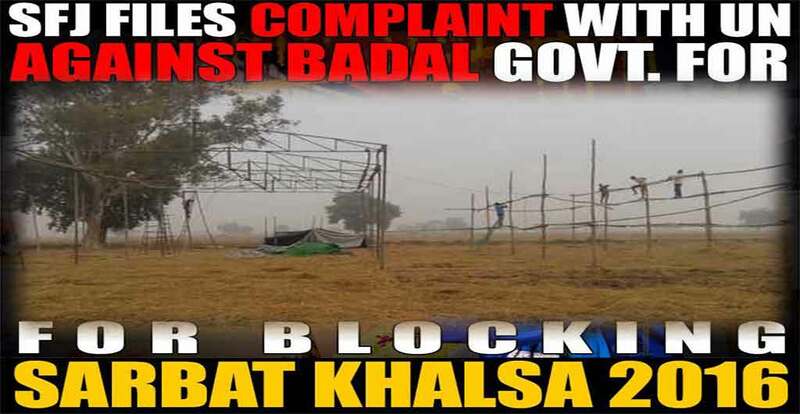 The complaint names Punjab CM Parkash Badal, Home Minister Sukhbir Badal, DGP Suresh Arora and Bathinda Deputy Commissioner Basant Garg as the government officials responsible for curbing religious freedom of Sikhs and illegal detention of hundreds of Sikh activists. November 09 complaint, filed with the UNHRC Under Special Communication Procedure alleges that “the police crackdown and illegal detention of Sikhs have been conducted because they wanted to hold peaceful global religious gathering […] on November 10 at Talwandi Sabo, Punjab”. ‘Sarbat Khalsa was called was called to discuss Sikh issues including: repeated and ongoing incidents of desecration of Sri Guru Granth Sahib, the holy book of Sikhism, since 2015; and Killing of several Sikhs by the police firing while peacefully protesting against the desecration of [Sri Guru Garnth Sahib]’, the complaint further stated. The complaint lodged through rights group “Sikhs For Justice” (SFJ) will be will be taken up by the UN’s Working Group on Communications, which consists of five independent and highly qualified experts to assess the merits of the complaints. The current members of the Working Group belong to China, Argentina, Russia, Austria and Ethiopia. “We will present evidence to UN Rapporteur on Religious Freedom that 2015 Sarbat Khalsa attended by millions, was a peaceful religious gathering which counters Badal’s government claims”, added attorney Pannun. Sikh activists Amardeep Singh Purewal USA, Paramjeet Singh Pamma UK, Joga Singh UK, Harjeet Singh Holland and Ranbir Singh Soodan Canada who filed complaint with UNHCR were coordinating an international campaign in support of the Gurmatas that was supposed to be presented during global religious gathering at Talwandi Sabo on Nov 10. The Special Rapporteur on freedom of religion or belief is an independent expert appointed by the UN Human Rights Council to examine incidents and governmental actions that are incompatible with the Universal Declaration of Human Rights.